1. Place our link on your site (we prefer the top of the page if possible). 2. email us at Admin@TheViperStore.com to make the request. Link text or banner ad no larger than 400 X 60 pixels, no animation. 3. We will post your link within 24 hours and email you back. 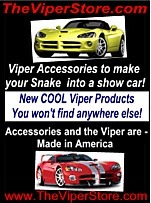 NOTE: Be sure that the hyperlink www.TheViperStore.com is attached! and Parts to make your Dodge Viper into a show car! Newest products you won't find anywhere else!